Forget Beckham, Zola or Henry – Hemel Hempstead Town skipper Jordan Parkes is fast establishing himself as the new king of the dead ball. Parkes has now notched up 10 goals direct from free-kicks this season, including a stunning left-footed effort against Hayes & Yeading yesterday. Speaking recently, Parkes admitted that he now fancies himself to find the net whenever he places the ball on or around the edge of the area. “It’s all about practice really,” he said. “I’m always practicing in training and this season I feel confident going up to every free-kick and feel as though I’m going to score. 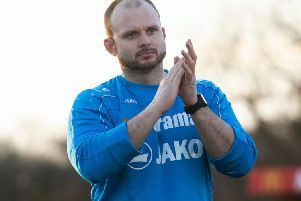 Parkes will be looking to add to his tally when the Tudors welcome Chelmsford City to Vauxhall Road on Tuesday night in a crucial Conference South clash. This season I feel confident going up to every free-kick and feel as though I’m going to score.